The Bureau of Land Management and the National Biological Information Infrastructure Great Basin Information Project collaborated on a compilation of literature addressing grazing as it relates to Sage-grouse habitat. The Literature Synthesis of Livestock Grazing Management Literature Addressing Grazing Management for Greater Sage-Grouse Habitat in the Wyoming Basin - Southern Rocky Mountains Ecoregions is now available. This is a synthesis of the literature review located below. This document is not intended to be an all-inclusive guide to grazing management in sage-grouse habitat, but rather an information reference that sage-grouse local working groups and land managers may utilize as they develop recommended grazing practices for promoting the conservation of sage-grouse and sagebrush habitats. The Literature Review of livestock grazing effects on sagebrush ecosystems for the Reference Synthesis of Livestock Grazing Management Literature Addressing Grazing Management for Sage-Grouse Habitat project is now available. This is an information reference that sage-grouse local working groups and land managers may utilize as they develop recommended grazing practices for promoting the conservation of sage-grouse and sagebrush habitats. 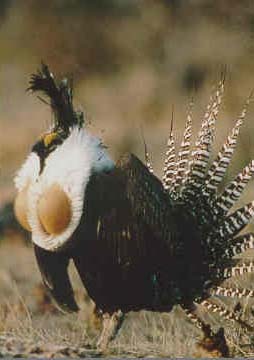 December 2007: US District Court reverses the USFWS’s 12-Month Finding concerning the listing of the Greater Sage-grouse, and remands the case to the agency for further consideration.